This Artist Got Cancer Of The Pineal Gland. His Paintings Will Leave You Speechless. The tiny, pea sized pineal gland located in the center of the human brain has for ages been thought to be the seat of the soul, or the third eye, the organ which makes spiritual connection and spiritual experience possible. Prone to calcification from fluoridated water and other toxins in our food supply, many people are actively interested in detoxifying and de-calcifying their pineal gland, because they feel it helps bring them closer to spirit, contributing to an awakening of consciousness. Exercises and meditations aimed at activating the third eye do work, and for people who have experienced the rush of cosmic energy that is available when the mind’s eye is wide open, there is no other spiritual experience that compares to it. The mystery of the pineal gland is one of divine importance, but what happens to a person who loses this gland to disease or some kind of accident? Does this mean that they lose their soul? Does it mean they have no spirit or no connection to the spiritual dimensions of human existence? The mystery of the pineal gland is visible in the artwork of Shawn Thorton, who, while studying art in school developed an illuminated painting style that baffles the rational mind and pokes a stick in the third eye of pineal gland skeptics. Experiencing severe illness, and often having manic and visionary episodes which revealed the contents of his extraordinary paintings, Shawn was learning to paint while, yet unbeknownst to him, he was suffering from brain cancer and had a tumor forming right where his pineal gland sits. 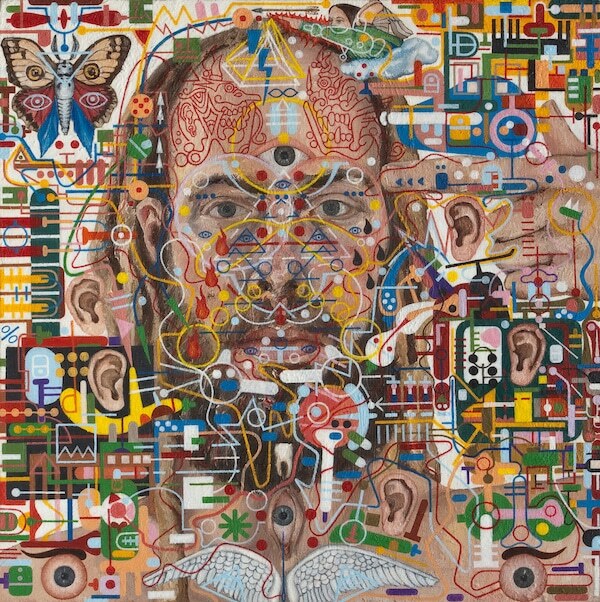 See for yourself, the imagery in his paintings is heavily infused with the symbolism and mythology of the pineal gland, and the over-arching style is reminiscent of an alien technology, laden with intricacies, schematics, and winding connections, a sort of motherboard of madness. Much like the human brain, his paintings show a complexity that is not easily understood, but, when you consider that his style emerged while his pineal gland was being attacked by cancer, then it is possible to look at his work with an eye for something bigger. Could it be that the injury to his brain in such close proximity to his pineal gland caused some kind of channel to open, where information from some other dimension crept through? Was his pineal gland releasing DMT, the spirit molecule in elevated levels while battling cancer? Do the similarities in some of his works to that of the ancient Egyptians and other spiritual adepts mean that the pineal gland is in fact some kind of trigger or portal that can carry consciousness to a non-material realm where information and inspiration can be found and brought back into our 5 sense reality? Here are a few statements by Shawn, referring to the inspiration and circumstances of his artwork, as well as a few samples of his paintings. Take a look for yourself, and ask yourself if the mystery of the pineal gland is worthy of greater consideration. “I suffered from a slow growing cancer in my pineal gland while I attended art school and during subsequent years while my paintings developed with an underlined mythology that alluded directly to the pineal years before I even know of its existence. I think I’d work myself into a frenzy for a while and yes, when I would fall lie down in bed I’d have something like a manic episode that was very lucid and visionary. That still applies to this day, but I try to control it better so I don’t get sick again. I’ve had a lot of truly mystical and otherworldly experiences as a result of my history and battle with brain cancer and I’m really drawn to things that resonate with a certain powerful energy, and I’m always honing in on that more and more. whether consciously or subconsciously. “Painting, for me, is largely an attempt to decrypt the mechanisms of illness through a disciplined medium. I feel, on some deep internal level, that through my painting practice I’m engaged in a psychic process to illuminate the intricate vessels and cogs of an insidious physic current that stems, in part, from having had a serious illness, and all the subtle and profound ways I was altered by this experience. All throughout my early adulthood, I struggled from the mental and physical effects of a slow growing tumor in my brain, the symptoms of which were repeatedly misdiagnosed by my doctors as purely psychological in origin, and it ultimately took over half a decade to get a proper diagnosis and treatment to shrink the tumor. I suffered immeasurably during this period from having repeatedly undergone a host of treatments meant to treat the symptoms of mental illness, and paradoxically, from a mental illness that ultimately could not be contained. The tumor was in the very center of my brain, in a small, mysterious organ at the top of the spinal column, the pineal gland. I didn’t have any prior reason to consider the actual material existence of the pineal before this. As for its spiritually ominous and physically precarious location at epicenter of my being, my ability to conceptualize these facts seemed utterly unreal, ethereal, like nothing short of a sordid space exploration, as it had been making its presence known to me for so long and now there were surgeons probing into my head – into my consciousness. As I further researched my illness directly after being released from the hospital, and after having had undergone emergency brain surgery a few days earlier, I quickly became very quizzical by what I was finding. What had been developing in my art, half unconsciously, over the previous several years in which I had been very ill and labored to keep painting, all of a sudden became very clear. Elements in the paintings seemed to correlate directly to the pineal gland and to many of its mystical and biological functions that have puzzled humankind for centuries. Take a look at more of Shawn’s artwork on Flickr, here.